While BlackBerry 10 had previously been seeing very aggressive upgrade rates, December saw only a modest uptick in those using the latest OS version. This is most likely due to some wireless carriers (like Verizon) continuing to block this update from their users. With 76.9% of Stuff I Need users running OS 10.2, users of the checklist app have once again been a bit quicker to adopt the newer OS than the users of Pixelated have been. For Pixelated use of the newest OS was up to 61.2% which is less than a two percent increase from November. 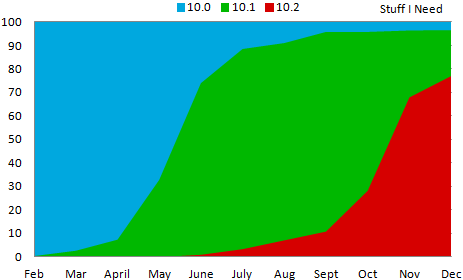 For December statistics on the distribution of BlackBerry 10 devices, see yesterday’s post on BerryReview. The short version is that the BlackBerry Z10 currently accounts for 62.2% of the market. This data was collected by BlackBerry World for downloads of the free strategy game Pixelated and the free checklist app Stuff I Need. 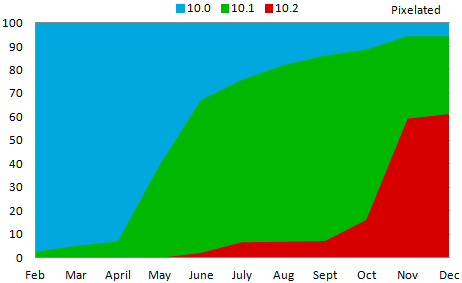 Data shown on the chart is from the beginning of February 2013 through the end of December 2013.